Buying a bank is a prudent way to benefit from India's economic development, as it grows in lock-step with GDP. There are three private Indian banks that make my shortlist, but I take into account the potential of the insurance market, both in life and general insurance. Only two banks (HDFC and ICICI) stand this test, and so it comes down to valuation. ICICI trades at a more attractive valuation than its competitor. I have held two Indian positions in my stock portfolio: a fund tracking India in general and ICICI (IBN) bank. I have liquidated the former, while I added to the latter. Why? Because this private bank is one of the best ways to play the modernisation of India. India is one of the biggest countries in the world. It has a population of 1.2+ billion. To get right to the point, I will tell you why I want to own a financial in India, rather than another kind of business. Financials tend to grow in lock-step with economic growth. Starting a business and you need a loan for that? The bank gets a cut. Need to pay for your daily expenses? Get a bank account and the bank gets a cut. Saving up your money? The bank gets a cut. The list goes on and on. If economic activity in India increases, whether it be through more consumption, more investments, or anything else, the banks will thrive. India is one of the few economies growing at a 6%+ growth rate. It has done so for the last decade, and will likely continue to do so. The beauty of financials is that I don't need to pick the industry or even the business/brand. Will Indians prefer taking trains, or taking airplanes? Doesn't matter much. Will they prefer a fresh Mango Lassi or coffee from Dunkin' Donuts? Doesn't matter much. We've talked about India housing almost 1/5 of the entire world population. What's more astonishing is the fact that 50% of its population is younger than 25 years. This means lots of people still have to enter the 'productive' part of life. That is, to say, where one works and spends money. I know this might sound a bit cruel, I have travelled in India for a couple of months, so I am well aware of the poverty and the child labor. But from an objective point of view, there is a lot of consumer demand and productivity growth in the future. A contributing factor is urbanisation. Many studies show that urbanisation leads to more economic prosperities. There are many reasons for this, and I encourage you to read up on the subject yourself. In 2017, the urbanisation rate was north of 30%, according to the world bank. In 2011, only 35% of adults in India had a bank account. In 2014, this number rose to 53%. In 2017, 80% of adults in India had a bank account. While this is a phenomenal evolution, likely benefitting Indians across all walks of life, India still has the biggest size of 'unbanked' citizens. There are still 191 million Indians without a bank account. Think about it: that's 36% of the European population or 58% of the population in the United States. As you can see, only three of the ten biggest banks in India are privately owned. While I'm not particularly fond of holding any government-owned assets, I'm especially not willing to do this in India. The role of a bank will differ. It's just too much of a risk, as government officials might use the bank for other things than generating returns for shareholders. Also, I'm not able to follow closely the political movements in the country, another reason why I'm not willing to take this risk. I want to own a big bank. India is a big country, only a big bank seems like something that can ride the general modernisation and economic improvement in the country. I don't want a bank only providing services in the east, suddenly being hit by a natural disaster, and not providing any meaningful return. While Axis's P/E ratio is clearly off, HDFC and ICICI trade on a similar valuation. Let's start by explaining why HDFC and Axis aren't really top picks, and then continue by showing the extra benefits of owning ICICI Bank. In a Forbes contest, HDFC ranked 1st as India's best bank, followed by ICICI on spot number two. HDFC will come out with earnings on April 23rd. Let's take a look at the latest Q3 earnings, the latest we have, to see how the bank is faring. The bank posted a 20.3% growth in net earnings. Total deposits grew by 22%. There is a good analysis of HDFC here (video). The bank posted a 43% growth in net operating profit. But how did ICICI bank do? These numbers are worse than the other two. Then why do I favour ICICI bank? The insurance market in India is huge. The Indian assurance market is estimated at $280 billion by 2020. Private companies have a 48% market share in general insurance and 29% in life insurance. ICICI Pru (ICICI Prudential Life Insurance) had an 11.3% market share in its latest quarterly report. ICICI bank owns 54% of ICICI Pru. It's bringing in more and more business, and at better margins, too. It has 95% of annual premium equivalent in the retail business, or nearly 90% of total AUM. Then you have the other branch, ICICI Lombard, which deals with general insurance. This is where it gets interesting. 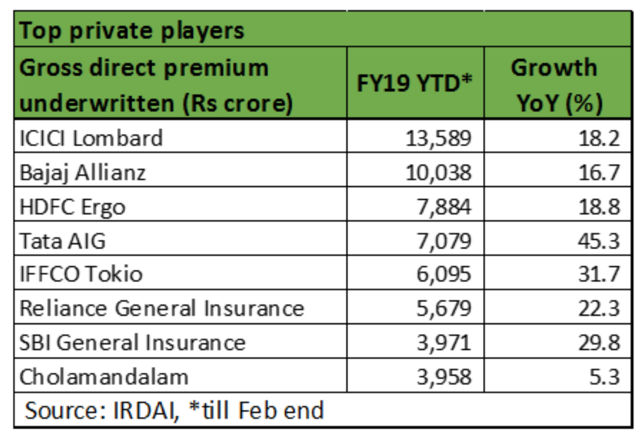 ICICI Lombard has the biggest market share of the private general insurance companies. While growing at the same rate as HDFC, it still has a much larger market share of 8.9% versus 5.2% for HDFC. According to the latest filing, ICICI bank owns 55% of ICICI Lombard. Axis bank is nowhere to be seen in terms of insurance market share, so it's out of the picture for me. There has been a battle between HDFC and ICICI bank in this analysis. Both are doing very well and are trading at similar valuations. Actually, you could own both. I have ICICI in my portfolio since August 2018 and it has delivered nearly 30% in returns. If I would have bought HDFC, it would have given me only 5% in returns. ICICI seems to have a head-start in the growing general insurance market by owning ICICI Lombard. It also offers health insurance through ICICI Pru. ICICI bank seems to be the 'digital first' bank in India. I believe this to be a long-term cost advantage. Over 95% of transactions was done outside of branches. ICICI is valued a lot cheaper than HDFC at 2.24x price-to-book. HDFC trades around 5.6x price-to-book. I will likely add to my position in ICICI over the coming weeks. Disclosure: I am/we are long IBN. I wrote this article myself, and it expresses my own opinions. I am not receiving compensation for it (other than from Seeking Alpha). I have no business relationship with any company whose stock is mentioned in this article.